Charbax has posted another hands-on video from IFA, and this time around he spent time with Pocketbook's newest tablet, the A10. I know that it might look odd to see the buttons lined up like that, but that was part of the design. The tablet has a wedge shaped design with the thickest part under the buttons and the back is rubberized so you can get a better grip. The A10 is running Android v2.3 Gingerbread on a Texas Instruments 1GHz CPU. It has a 10" (1024x768) capacitive touchscreen, and it will come with Wifi/Bluetooth, 4GB Flash storage, g-sensor, a microSD card slot, speaker/mike, and a 2MP camera. Charbax was his usual charming self and he managed to talk a lot of details out of the tech rep. The retail is going to be 299, but it's not clear if that is the price in euros or dollars. The A10 is supposed to hit store shelves in November, just in time to compete with the AmTab. The PB rep said that it had around 7 hours battery life, and if you turn it upside down the screen will automatically reorient itself. 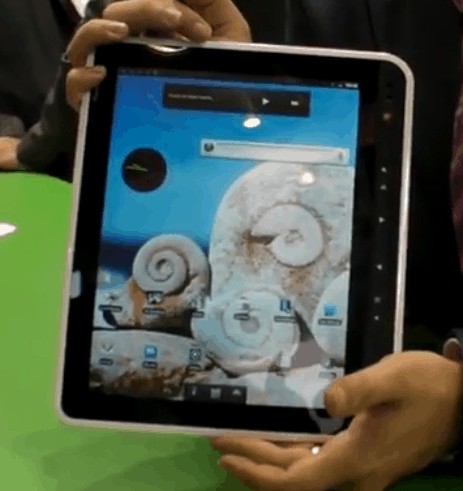 It's a pretty slick looking tablet, isn't it? I really hope that the price ends up being $299, but even at that price I'm not sure it's worth it. For not too much more I could get the Asus Transformer. It’s nice to finally see an Android tablet with the right form factor for magazines, documentation and comics. Pity it will not be updated to Ice Cream. Where do you buy one of these pocketbook a10? Help me!! !